For most IT departments, increasing the use of server virtualization is a strategic imperative as they seek to alleviate the affects of the tough economic climate. 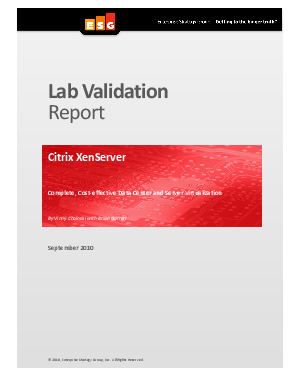 In this report, the Enterprise Strategy Group documents their conclusions from hands-on testing of the advanced virtualization management features of Citrix XenServer. If the rising cost of your current server virtualization solution is limiting your deployment, download the report to find out why XenServer may be exactly what you need to take more virtualization benefits to the bank.